This security poster illustrates the TM-57 Russian Anti-Tank Mine. This mine was the first of the Russian mines to be fitted with a clockwork delay to arming fuze mechanism. It can also be fitted with a tilt rod fuze mechanism. This anti-tank mine is larger than the TM-46 series with greater explosive weight. 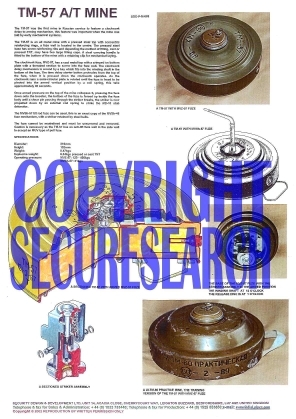 This security poster features the TM-57 Russian anti-tank mine’s technical specifications, a sectioned TM-57 with armed MVZ-57 fuze, a TM-57 with MVSh-57 fuze, a photograph of a TM-57 with MVZ-57 fuze, and a photograph showing the base of the MVZ-57 fuze. The security poster also shows a photograph of a UI-TM-60 practice mine and a sectioned striker assembly. A sectioned TM-57 with armed MVZ-57 fuze. A TM-57 with MVSh-57 fuze. A photograph of a TM-57 with MVZ-57 fuze. A photograph showing the base of the MVZ-57 fuze. A photograph of a UI-TM-60 practice mine. The TM-57 Russian anti-tank mine’s technical specifications. This security poster features the mine's technical specifications, a sectioned TM-57, a TM-57 with MVSh-57 fuze, a photograph of a TM-57 with MVZ-57 fuze, a photograph showing the base of the MVZ-57 fuze, a UI-TM-60 practice mine and a sectioned striker assembly.